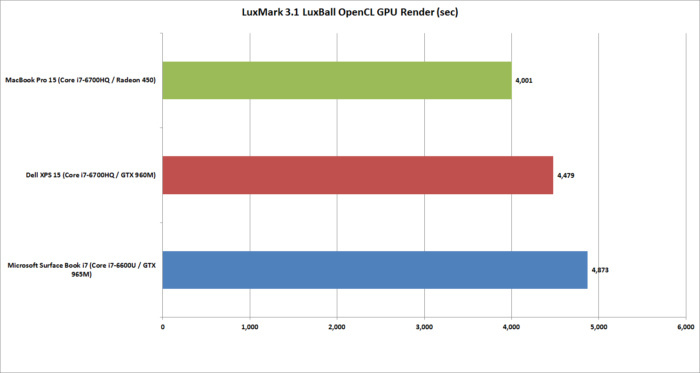 Moving to the MacBook Pro 13, the result is a little more nuanced. 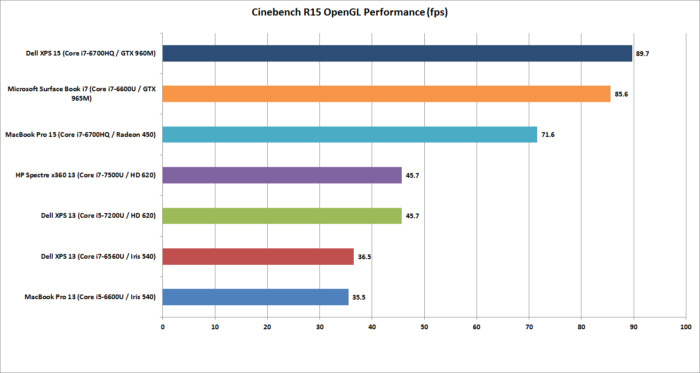 With roughly nine hours of run time, it compares well to some laptops, such as the XPS 13 with a QHD+ touchscreen. But there are a lot more PCs ahead of it. You know, like the Surface Book i7, which sets the bar at an amazing 13 hours of video run time. Other laptops with better video stamina include the newest XPS 13, HP’s redesigned Spectre x360 13, and even the older Surface Book. 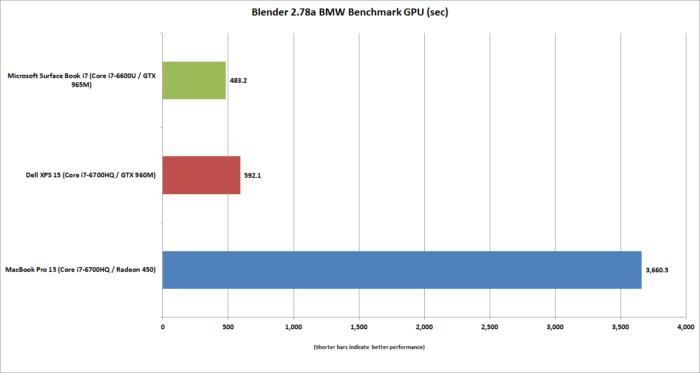 When you consider that all three are also generally faster, it’s not good. The Surface book i7 sets the bar with 13 hours of battery life, compared to nine hours or so for the MacBook Pros. 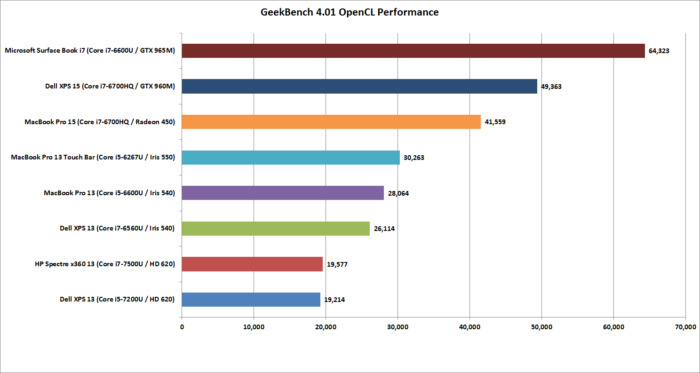 The most important question to most isn’t some obscure OpenCL benchmark but how much these laptops cost. 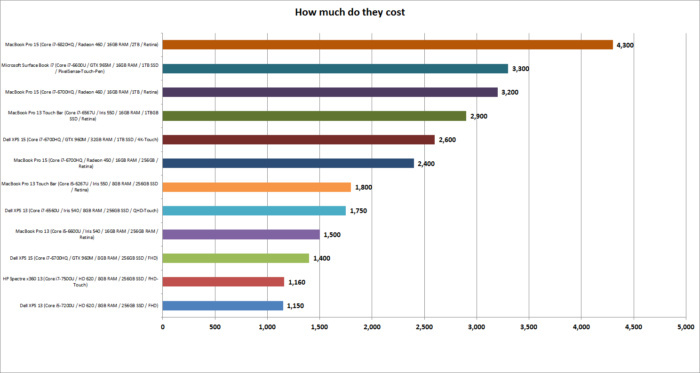 To help you understand just how much of a premium Apple and Microsoft are charging, I mapped out the cost of most of the laptops that appeared here, along with other configurations worth highlighting. That top-spec Surface Book i7, formally known as Surface Book with Performance Base, really pushes the boundaries of what people will pay for a dual-core laptop. To be fair, this is no ordinary laptop. It has a 1TB SSD and 16GB of RAM, plus pen support, a tablet mode, and probably class-leading GPU performance. But umm, yeah, 3,300 bucks. Apple is no stranger to nose-bleed altitudes. When you throw a Core i7, 1TB SSD, and 16GB of RAM into the MacBook Pro 13 with Touch Bar, you’re looking at $2,900. And you don’t even get the discrete GPU, touch, and tablet or pen support of the Surface Book. Apple’s most powerful MacBook Pro 15 tilts the meter all the way to $4,300. Granted, that’s with one of Intel’s priciest mobile CPUs and a whopping 2TB SSD, but that’s also the price of a modest used car. 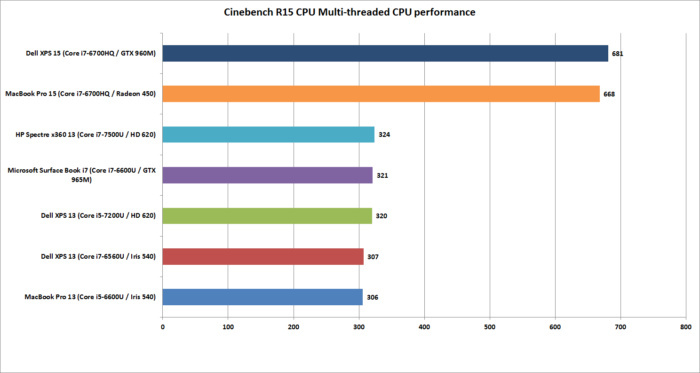 Compared to a “normal” PC, both Microsoft and Apple give you a lot less performance for your cash. The Dell XPS 15, which pretty much aces the new MacBook Pro 15 except with battery life, is $1,400. Take that Dell XPS 15 and load it up with a 1TB M.2 SSD, 32GB of RAM (which isn’t available on the MacBook Pro 15); a GTX 960M, 4K touch screen, and a larger battery: $2,600. That’s only $200 more than what Apple charges for machine with 16GB of RAM, a 256GB SSD, and the slowest Radeon Pro GPU. You can do the same with the new HP Spectre x360 or Dell’s current XPS 13. 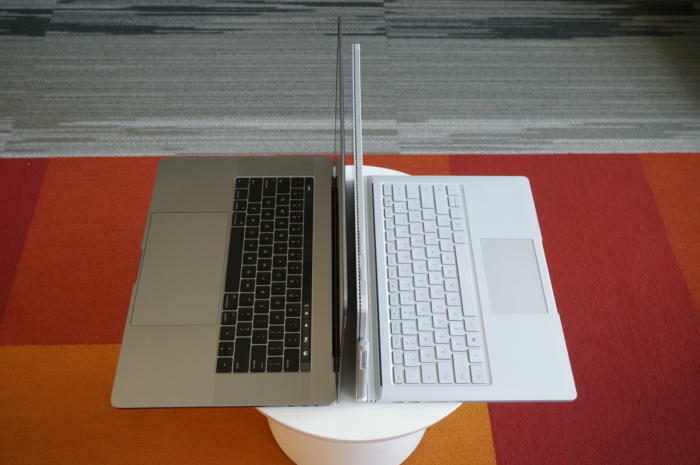 Both give you a lot more value than either the MacBook Pro 13 or the MacBook Pro 13 Touch Bar. Numbers don't lie. 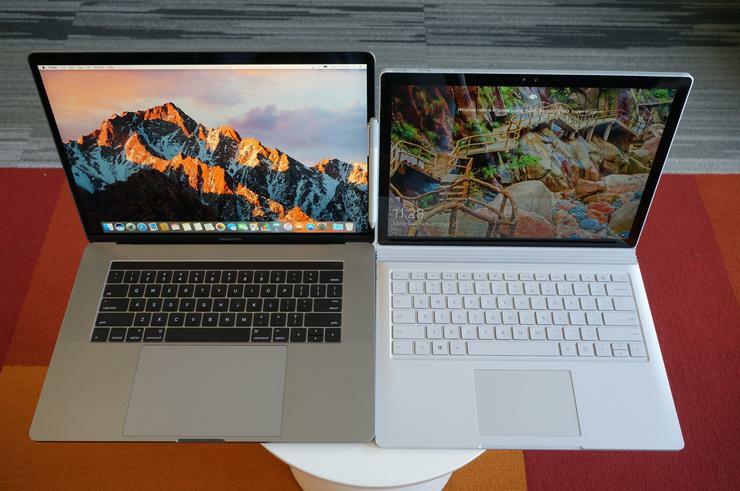 Apple’s MacBooks are overpriced, and so are Microsoft’s premium Surface Book devices. 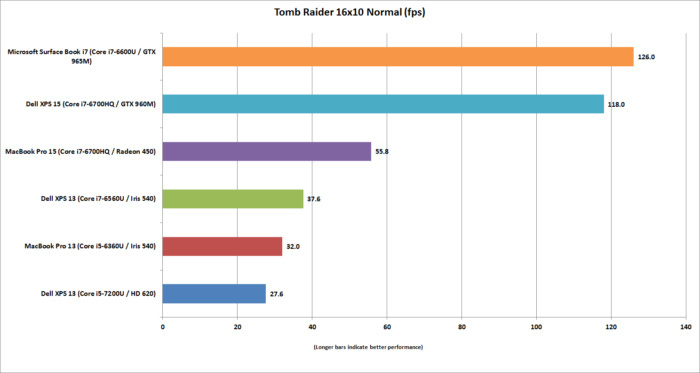 The PC OEMs give you a lot more for your money. 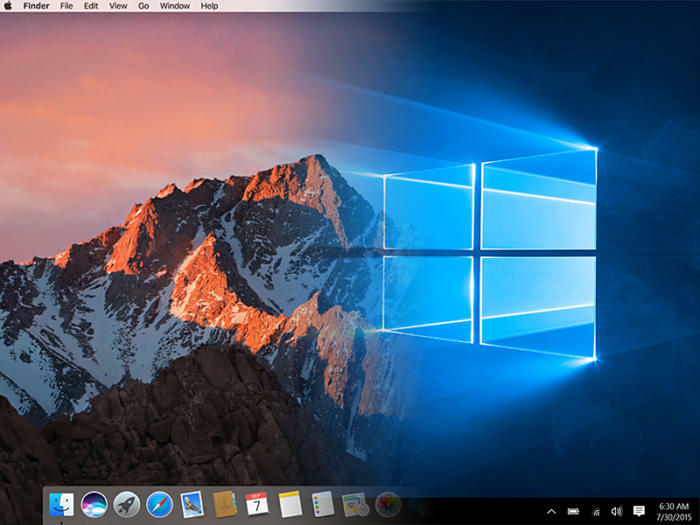 Apple and Microsoft clearly don’t provide the value that other PC makers can. Ten tests and one price comparison later, the PC wins. Again. That’s no surprise. 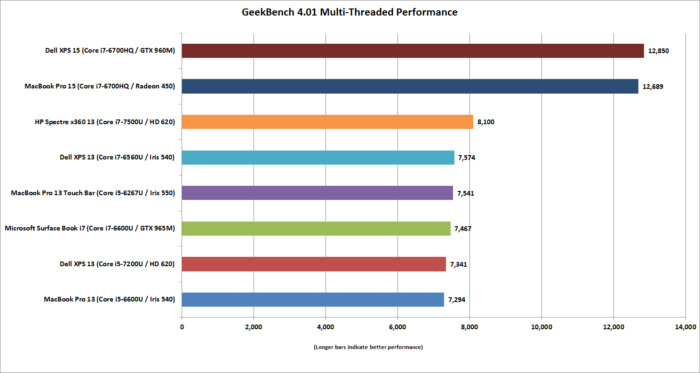 The MacBooks are caught in tough spots—even if they were running, higher-performance configurations. 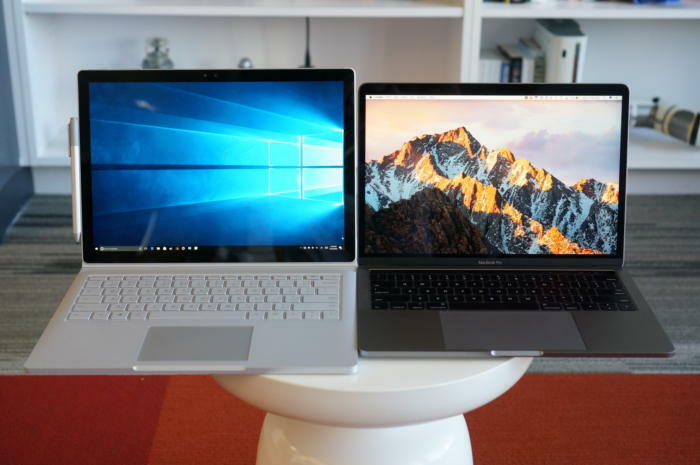 They’re both ultra-expensive compared to most PCs and at the top-end, outclassed in GPU performance by Microsoft’s comparably expensive Surface Book i7. It’s not all bad news on the Mac, though. The MacBook Pro 15’s battery life is impressive for a 15-inch laptop with a quad-core CPU and discrete GPU. 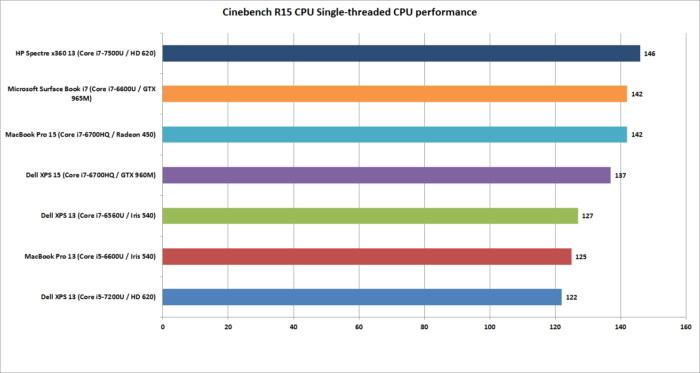 Comparably powerful quad-core laptops we’ve seen can’t touch it in battery life. 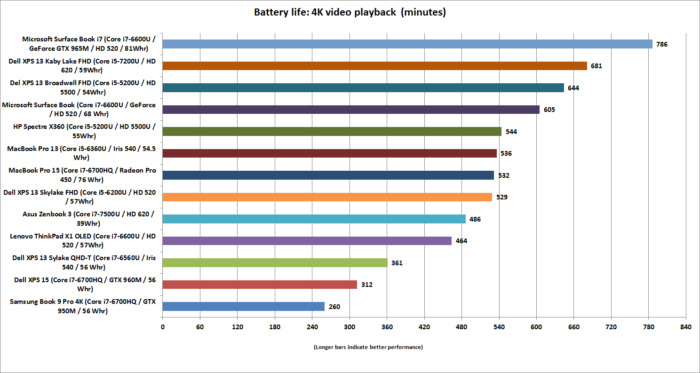 Even the MacBook Pro 13s do relatively well in battery life compared to a similar PC. 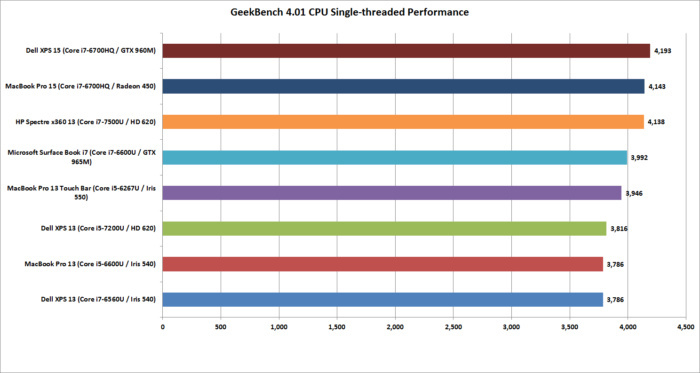 The problem for Apple and the Mac fans is PC makers just don’t ever stand still. And as we know, Apple seemingly does that now with its Macs.